On October 28, Terminal Velocity Aerospace (TVA) signed a Space Act Agreement with NASA Ames Research Center to collaborate on evaluation, testing, and technology transfer of newly-developed thermal protection system (TPS) materials. 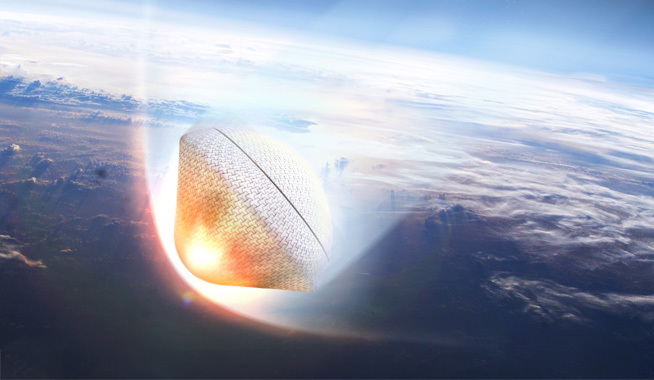 This new development is a multi-year non reimbursable Space Act Agreement and presents both manufacturability and cost saving advantages for customers of TVA’s Reentry Devices (REDs), which collects data during the fiery conditions of spacecraft reentry. “The chief benefit of the conformal thermal protection systems materials developed at NASA Ames is their manufacturability, especially for small reentry probes like TVA’s REDs. By employing the Ames TPS technology, TVA will be able to produce heat shields at lower cost, and those savings can be passed on to customers,” DePasquale said. The basketball sized ReEntry Device (RED) joins the journey of a deorbiting vehicle as it relays data on the physics behind atmospheric breakup (Credits: TVA). TVA began operations in 2012 and is dedicated to improving reentry safety and furthering the utilization of outer space. The company offers a family of small REDs for data collection and cost-effective small payload return through an ongoing relationship with The Aerospace Corporation, and a research and commercialization partnership with the Georgia Institute of Technology. With the goal of advancing the understanding of reentry and breakup incidents, TVA is working towards addressing the present lack of high quality data on the subject. Atmospheric breakups are the best method for removing spacecraft from orbit. However, TVA reports that 10-40% of spacecraft mass survives reentry. Such debris usually has a high melting point and poses a danger to the public since the location of its landing is currently unidentifiable in advance. Our RED-Data device provides a first-hand account of what occurs during reentry and breakup. The basketball-sized device rides aboard a host vehicle to collect pressure, temperature, acceleration, and other engineering data during the actual reentry event. This high fidelity reentry data is very useful for scientists and engineers for calibrating prediction models and designing for survivability or intentional demise. The newly signed Space Act Agreement with NASA Ames provides for arc-jet and other ground testing of the new TPS materials at NASA Ames in preparation for flights on TVA’s REDs. With a line of RED-Data devices and Space Act Agreement with NASA Ames under its belt, the next step for TVA involves utilizing the TPS material developed at Ames in the next generation of RED devices, RED-Data2. These development brings humanity one step closer to gaining a fully comprehensive understanding and greater ability to predict the characteristics of uncontrolled spacecraft reentry and breakup incidences so that accurate safety precautions can be put into place in advance. Image caption: The Space Act Agreement provides for Arc-jet testing of thermal protection system materials at NASA Ames Research Center in which the conditions experienced by a vehicle during atmospheric reentry are approximately created (Credits: NASA).